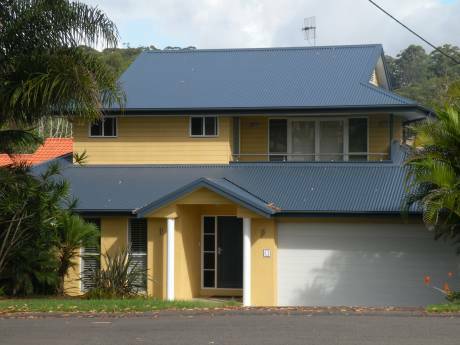 Large home 1 km from the sea and beautiful Australian beaches, 1 1/2 hours north of Sydney. Our recently renovated home has polished floorboards and carpets upstairs and tiles and carpets down. In the back yard is our solar heated, low maintenance pool that can be viewed from our upstairs or downstairs decks. We often socialise with our neighbours either at the Surf Club or for BBQs at ours or theirs. The local beach is quiet and beautiful at the northern end of the well known Avoca Beach. Upstairs we have modern kitchen, and open plan lounge and dining room with sliding doors out onto a deck. There are also 3 bedrooms although we use the smallest as a second study/ computer games room. The main bedroom has an ensuite and walk-in robe. Downstairs is another bathroom next to the third double bedroom with sliding door access to the downstairs deck. Also downstairs is a large laundry, rumpus room and our main study. The rompus room has a fold out sofa and could be used as another bedroom if needed. Outside we have lawns and trees and water tanks to beat the drought. Our block is 800 metres square with lovely neighbours all around. It is a very leafy neighbourhood with very large gum trees and grevilleas. Kookaburras, lorrikeets, parrots, cockatoos and brush turkeys visit daily and roost in local trees. If you like you can hand feed many of these birds. We have off street parking for two cars and spaces on the street for more. As we live so close to the beach we visit it regularly. From October to March every year our 8 year old attends Nippers at the North Avoca Surf Club on Sunday mornings. The children have races on the sand and in the ocean, swimming and on boards. Parents socialise and we all end up having a swim and a BBQ. Sometimes we return late in the afternoon for social drinks while the kids play together outside. Many of our close neighbours, all with young children, also attend Nippers so we often socialise with them. They are very friendly and would definitely look after any of our visitors if wanted. Between our house and the ocean is a lagoon surrounded by grass and trees. There are walking tracks that you can take around the lagoon. Some people even paddle on the lagoon to the larger lake at Avoca. Throughout the area are large gum trees, grevilleas and introduced species. The area is green and leafy and so protected from the worst heat of summer. Our winters are fairly mild. Ours is a quiet suburb but Terrigal to our north and Avoca to our south are holiday beach spots with many fine restaurants and cafes. Many Sydney residence pop up to the coast in the warmer months for a weekend break. Sydney centre is only 1 1/2 hours away by freeway or rail. I am a teacher at the local high school and my wife works in nearby Gosford as a lawyer. We are both in our forties. Our 8 year old son attends the local public school and loves playing soccer (football) with his mates. He swims, plays tennis and enjoys having friends over. He is very social and makes friends with ease. My wife and I have travelled a great deal and both of us have lived and worked in the UK. Although our son has tavelled to Europe twice already we would love him to have the opportunity to be immersed in another culture and to learn the language. That is why we wish to stay for so long.